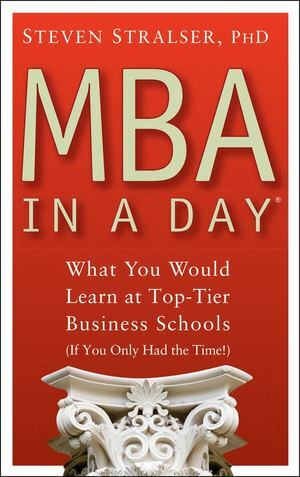 The same critical information top business schools teach<br /> Based on Professor Stralser′s popular seminar series, MBA in a Day? is specifically designed for the busy professional (physician, attorney, architect, nonprofit executive, etc.) or entrepreneur/small business owner, who needs to know about the "business–side" of their practice, organization or business. With comprehensive coverage of vital business topics, important concepts and proven strategies taught at top graduate schools, this handy book offers a complete business education without the hassle of enrolling in an MBA program. Divided into four sections covering management and policy; economics, finance, and accounting; marketing; and systems and processes; this straightforward guide is easy to navigate and simple to use. Packed with illustrative examples, helpful anecdotes, and real–world case studies, this commonsense guide covers everything busy professionals would learn at the very best business schools–if they only had the time.<br /> Steven Stralser, PhD (Phoenix, AZ), is Clinical Professor and Managing Director, The Global Entrepreneurship Center at Thunderbird: The American Graduate School of International Management and founder and CEO of The Center for Professional Development, Inc., an organization dedicated to post–graduate training and education of today′s professionals.